Goal: Sometimes we need to profile remote Java apps that leak memory or are killed by the OS. 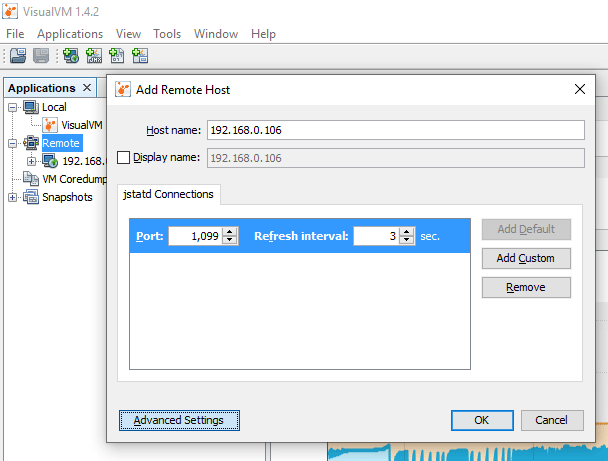 Let’s connect through an SSH tunnel to a remote JVM running JDK 11 on an embedded Ubuntu system and profile memory and CPU usage with free tools VisualVM and JStatD1. Here is the end result of our efforts. Being able to profile remote Java apps let’s us visualize memory leaks that might not happen for hours. Motivation: The OOM killer on my ODROID XU4 running Bionic (Ubuntu 18.04) comes to life now and then killing my important Java daemon process. I’d like to know why. Is my Java process leaking memory? 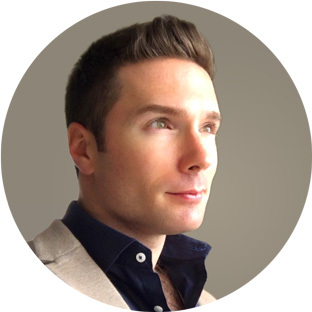 Is another process growing uncontrollably? 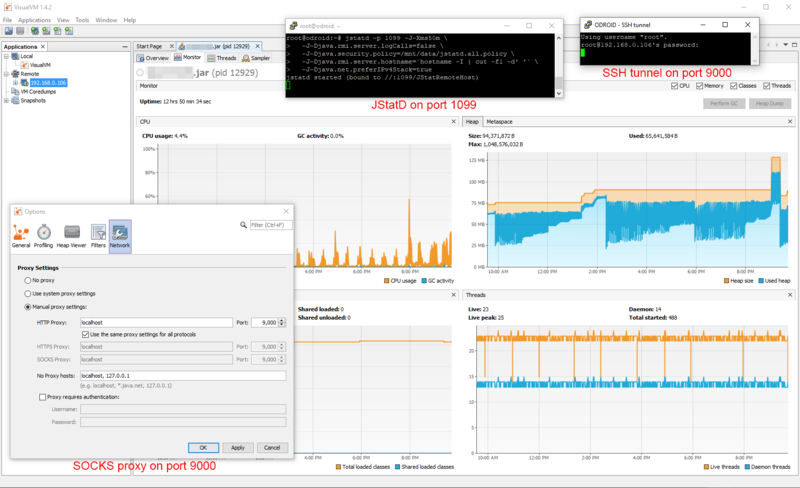 I’ll take a trip through system logs, then install and start up RMI server JStatD daemon under JDK 112, set up a SOCKS5 proxy, and finally connect to my embedded SBC with VisualVM to profile the Java memory usage. # Show each killed process and the preceding 50 lines journalctl -o short-precise | grep -i -B50 "killed process"
journalctl -o short-precise | grep -i -B50 "killed process"
printf '%d\t%d\t%s\n' "$pid" "$(cat /proc/$pid/oom_adj)" "$comm"
Next, let’s see what htop shows us. I’ll just look at the top usage. I restarted the machine about three hours ago and the real memory has grown to 334MB. What is causing the memory increase? Long story short, in my case systemd-journal grew to over 200MB which spun up the OOM killer. This was because the process cloudshell-lcd was calling a program smartctl to get the HDD temperature multiple times per second, but it wasn’t installed (apt-get install smartmontools solved this). Each failure resulted in a new log entry which, for the current boot session, was resident in memory and growing. Journald was then limited in memory usage. Having identified and hopefully solved the memory issue, I’d just like to be thorough and see how my Java agent process is performing. Let’s get started with remote profiling. The JRE is installed because Java processes are running. We need a small server tool called jstatd to listen on a couple ports for VisualVM to communicate with and attach to running JVMs. This tool is a development tool, so the Java JDK is required. Since Java 8 is officially not receiving free updates from Oracle any longer (as of January 2019), it’s really time to upgrade to JDK 11. You might be wondering why OpenJDK is showing version 10 when you installed JDK 11. That’s because JDK 11 wasn’t released generally until September of 2018, and until then JDK 11 really packaged JDK 10. Here is a discussion about it. Many of the guides I’ve found are valid up to Java 8. From Java 9 everything changes. These are the steps to take for Java 11 and hopefully beyond. If you are looking for tools.jar from another guide, it’s gone – replaced with jdk.jstatd in the policy file. More on that next. For security reasons the jstatd process cannot attach to any JVM, so it needs a security policy file. For JDK 11 an all-permissive policy file is shown below. Notice that permissions need to be given for jvmstat as well, another departure from previous Java 8 guides. This is not recommended for a production machine running, say Tomcat, but is good enough for small embedded SBCs3 and machines. Let’s start the jstatd RMI server daemon using this command. # Start the jstatd server listening on port 1099 and a *random* port. Gotcha: The -J-Djava.rmi.server.hostname=IP is needed to indicate that our embedded device’s IP is the hostname to work properly with VisualVM. If you connect with a hostname (set in a hosts file) then this parameter is not needed. For the brave, you might get away with using -Djava.rmi.server.hostname=`hostname -I | cut -f1 -d' '` to automatically get the private server IP address, or use simply `hostname -f` to use the server hostname. Your mileage may vary. Now the process is running in the background and listening on two ports. One port is the “rmiservice” port 1099, and the other port is… random. Let’s find out that port next. In this example the random port is 36955. Now, how do we open the firewall to a random port? The answer is… transparently. It’s tempting to run netstat -tlpn and find both jstatd ports. If using UFW, run ufw allow 1098,1099,xxxx,yyyy/tcp where xxxx and yyyy are the random ports for JStatD and JMX (see step 6). When you are finished, you can run ufw delete allow xxxx for each port. Be warned that you will need to open four ports. This is actually easier and safer than poking holes in the firewall. Let’s create a dynamic SSH tunnel to the remote JVMs that bypasses the firewall as far as VisualVM is concerned. This way that random port can be connected to transparently. On Linux it is as simple as can be. Open a new terminal, run this command, and minimize the terminal. Our SSH tunnel with be accessible on local port 9000. To exit, press ctrl+c as usual. You can open a command window and run plink.exe, but the PuTTY GUI is more fun with settings for SSH keys and logging. Let’s set up an SSH tunnel with PuTTY. First, create or duplicate your SSH connection settings that you normally shell into with. In the SSH setting, check “Don’t start a shell or command at all” as this is just a tunnel, not a shell window. It’s also a good idea to enforce SSH version 2 since we are here. Tip: You can customize many aspects of a PuTTY session. Since the session window needs to stay open and minimized, you can relabel the terminal window. Click on Window > Behaviour and set the window title to something like “SSH Tunnel”. Next, and most importantly, be sure to set a dynamic destination. Do not select either “local” or “remote”. We want the tunnel to terminate at essentially the NIC so we can connect to any port we like as the authenticated user. Connect. Is the SSH tunnel established? Right click on the title bar and select “Event log”. You can see the connection is established on port 1099 and a random port. In this case that port is 36955. Minimize this window. When we are finished with VisualVM we can return to this window and terminate the tunnel with ctrl+c. If you are okay with only heap memory graphing over time, or you are unable to add any additional startup parameters because the process is already running, you can run the JVM as you normally would and skip this step. For more powerful profiling abilities (and the ability to perform a heap dump), let’s enable the JMX4 built into Java with some additional properties. We bypass SSL (TLS) authentication because we are SSH tunneling and we trust the tunnel. Set the JMX port to 1098 so it is easy to remember. The hostname again must the hostname or IP VisualVM connects to. See the warning below. Remember: With JMX connections you must use a different jmxremote.port for each app you want to deeply profile. Gotcha: The -J-Djava.rmi.server.hostname=IP is the same with jstatd and is needed to indicate that our embedded device’s IP is the hostname to work properly with VisualVM. If you connect with a hostname (set in a hosts file) then this parameter is not needed. For the brave again, you might get away with using -Djava.rmi.server.hostname=`hostname -I | cut -f1 -d' '` to automatically get the private server IP address, or use simply `hostname -f` to use the server hostname. Your mileage may vary. There should be no error messages, and your Java app should be running. Let’s look at netstat -tlpn again. JMX opens port 1098 and another random port. Aren’t you glad we used an SSH tunnel and don’t have to configure firewall rules for random ports? 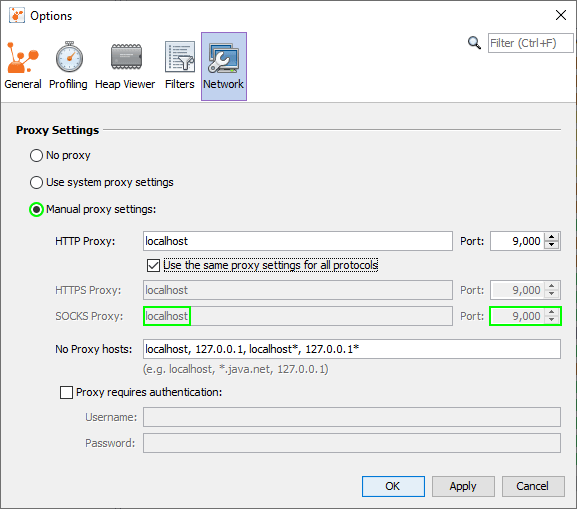 In VisualVM5 select Tools > Options > Network and ensure you enable manual proxy settings with the SOCKS proxy set to localhost (where PuTTY or ssh on Linux is listening) and port 9000. We’re instructing VisualVM to connect through our SSH tunnel via SOCKS. Click on “Remote” in the Applications panel and “Add Remote Host”. Let’s use the same IP or hostname as we did when we set up the JStatD and JMX settings. If you used the IP address 192.168.0.106 then use that again here. The default port is 1099, but you can click “Advanced Settings” to change the JStatD port. We must start with a JStatD connection before we can establish a JMX connection. Within a few seconds we’ll see under our new remote host the jstad daemon process and any running JVM apps. This means we’ve succeeded in connecting to JStatD through the SSH tunnel. Next, and only if you’ve started a Java app with the additional JMX parameters from above, right click on our remote host and “Add JMX connection”. Let’s use the JMX port 1098 we designated earlier. Leave the security credentials unchecked, but let’s make sure to check “Do not require SSL connection” because we are using an SSH tunnel instead. We should now see our running Java app and PID (Process ID) in parenthesis. Double-click on this app name and all the wonderful profiling information reveals itself. 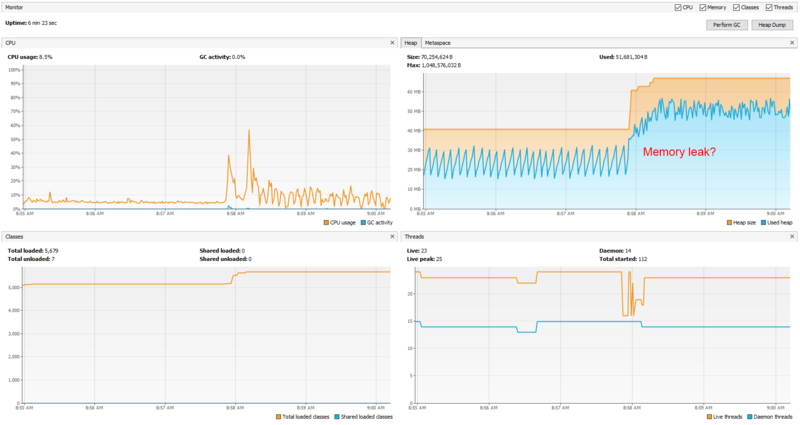 Tip: To increase the graphing period from the default one hour, select Tools > Options and update the charts cache. I’ve set mine to twelve hours (720 minutes) to adequately catch heap growth. Here are the CPU, heap, number of classes, and number of threads. Here is the real-time thread visualization. Finally, you can see a heap histogram to identify how your memory is distributed. Success: We’ve successfully installed JDK 11, started JStatD on the remote server, set up an SSH tunnel to avoid adding firewall rules, configured a SOCKS proxy, started a remote Java app with JMX, and launched VisualVM into a profiling session. 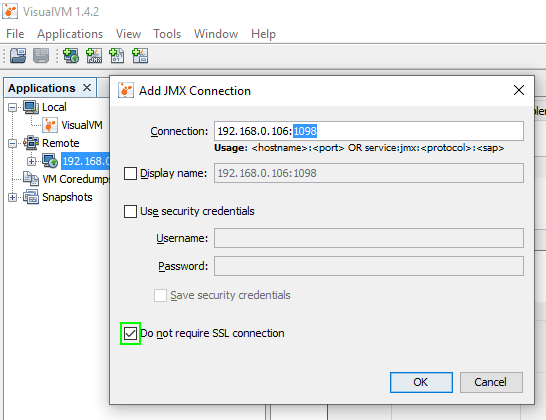 How to activate JMX on my JVM for access with JConsole?